Liferay is open source portal and it provides robust application features and capabilities which full fill real world end user needs. Liferay support many functions such as Portal Management, Content Management, Work flow Management, Document Management, User Management and Security Management. All these services liferay already implemented as it core features so that as developer we need not worry about underlaying services only we need to think about end user needs when we develop application. Layer is also comprised of the inter related service components and features Personalization,Collaboration, Social Networking, Delivery Channels, Virtualization Tunnelling Servlets and these services we can inherited from liferay core features. A Platform-Independent Model (PIM) in software engineering is a model of a software system or business system, that is independent of the specific technological platform used to implement it. A platform-specific model is a model of a software or business system that is linked to a specific technological platform (e.g. a specific programming language, operating system, document file format or database). Platform-specific models are indispensable for the actual implementation of a system. Domain-specific modeling is a software engineering methodology for designing and developing systems, such as computer software. It involves systematic use of a domain-specific language to represent the various facets of a system. EJB’s, Spring Framework, Hibernate Layer, Web Services. Service Builder Made up with implementation of Platform Specific Model (PSM) technologies such as EJB’s, Spring Framework, Hibernate Layer, Web Services. The services builder is the Model Driven Transformation (MDT) Tool which will construct and deploy services those are required by liferay portal and portlets. Liferay already a developed application so if any one wants to extend or add new features then liferay have given following extension frameworks these will be as part of Plugins SDK. Before 6.1 version we have separate Extension Environment later version it was added into Plugins Framework. Extension environment is for override existing portal source.Extension environment consist same directory structure i.e. portal follows. Extension environment override portal source files by placing in appropriate path where it actually in liferay source portal. Extension environment have different -ext.properties files to override existing portal and other languages propertied files. Plugin framework is for customize or extend portal and its hot deployable plugins means no need stop sever when we deploy and changes will be applied after successful deployment. Ant Targets so that we can run from command prompt. Liferay Portal Support many Server Environments such as Apache Tomcat, Glassfish, Geronimo, Jetty, JOnAS, JBoss, and Resin and this one of huge advantage so that we can deploy into any of the sported servers. Each application server provide many services which will be used by application those are deployed in the server. Each layer is differentiated by different color and each layer consist one more components. Any Software that required Operating System to run.so its base layer for any software. In the diagram is bottom layer represent Operating System. We already know liferay support Windows,Mac and Linux. Liferay is java web portal and to run any web application we need application server and application server will be running with help of JVM. 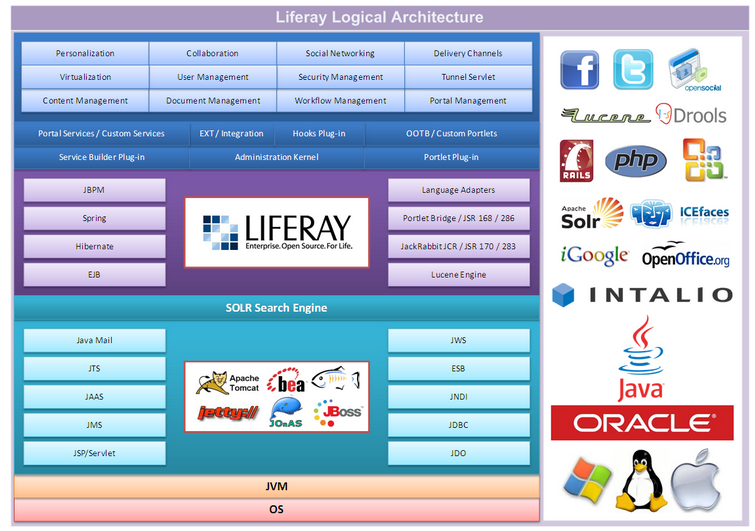 Liferay support many application servers such as Apache Tomcat, Glassfish, Geronimo, Jetty, JOnAS, JBoss, and Resin. liferay also use external services and These services can be deployed into application services and these services can be used by liferay such as SOLR Search engine DROOLS Rule Engine and Tunneling Servlets.When we required then we can deploy these services so that liferay can use. Search engines(SOLR/Lucene) provide capabilities like clustering, faceted search and filtering. This layer is actual liferay core implementation and its technologies.its provide robust capabilities to run and integrate other applications into liferay. Language adopter provide mechanism to develop and run other language portlet such as PHP, Ruby, Python and Groovy. To run Struts framework based portlet applications. To run spring frame work based portlets. Liferay use the JCR ( Java Content Repository) based implementation to maintain WCM such as Documents and Files.Liferay used Jackrabbit JCR implementation by default.Liferay also provide easy integration with other JCR implementation such as Alfresco. Its provide work flow management services in liferay portal. Liferay used Kalio work flow and JBPM(jBoss Business Process Management) these are reference implementation for BPM. Lucene Engine is inbuilt search engine in Liferay and its also support configurable SOLR search Engine and SOLR Search Engine also implemented based in Lucene. Liferay use different technologies to provide database relates services and other application services i.e. Spring,Hibernate and EJP are portal service implementation technologies. This layer provide defined mechanism such that we can customize or extend liferay features and provide rapid services implementation tools such as service builder. Liferay Service Builder Tool provide construct and deploy services and these tool use Spring and Hibernate to implement services. The portlet plug-in leverages on the portlet bridge to provide dynamically generated portlets to the end users and enhanced RIA integration. Portal Service/Custom Services are like core liferay services such as Group,Organization,Site,User and Roles services we can also customize services. Liferay also capable of develop and run OOTB portlets. Liferay provide custom portlet development through plugins SDK and OOTB portlet we can use any other webapplication frameworks such as spring,struts,JSF and vaadin. Layer:6 is real world application layer that user can experiences. Liferay used all above services and capabilities and it provide robust core features such as Portal Management, Web Content Management, Enterprise Content Management, Document Management, User Management, Work flow Management, Security Management.